Non-shedding, low shedding, allergy friendly, intelligent, sweet, playful, comical, intuitive, great with kids, easy to train, eager to please with very little to no doggy odor is just a few ways to describe an Australian Labradoodle. The puppies are just more adorable. With years of experience breeding, raising and training animals, West Coast Labradoodles knows what it takes to prepare a well socialized puppy to meet its challenges as a service/therapy/assistance/loving companion dog. It starts with choosing the right breeding stock, understanding and matching the temperament and the conformation criteria. Then, analyzing the puppy's temperaments and matching them with a future selective training program that will prove to be successful. All puppies are born and raised in my home. When puppies are old enough to enjoy outdoor play time, they enjoy a large covered cement patio area until proper vaccinations have been administered. Then a large backyard with lots of toys provides ample room for running and playing. A healthy diet starts with the mother's feeding program and continues when the puppy's start eating on their own. The puppies enjoy a clean puppy nursery. Once the puppies start drinking water, the water container and water is cleaned multiple times a day. Puppy socialization starts when the puppy is born and occurs many times a day until the puppy goes to their new adopted family. Socialization starts with gentle handling, petting and offering mother to potty them while they are being held. A trusting imprinting relationship between human and dog has taken place. This relationship continues and techniques advance according to appropriate age. 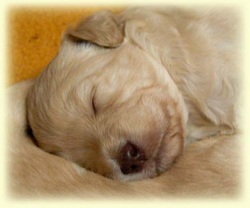 More information found on raising puppies under the menu: Puppies; Puppy Socialization.